Are you in a rush and have limited time for dinner on weeknights? Can you spare 10 minutes to make dinner? That is all the time this recipe needs. It is truly simply, easy and a great way to mix up a quick dinner. Acorn squash is a winter squash, meaning it is in-season during the winter (we don’t find many in-season foods during Canadian winters). To make it even better, it stores very well in cool dry places – just waiting for you to use it in your next dinner rush. Plus, who doesn’t love garlic? Obviously you can substitute any other spices you want to mix the flavour up, but I do love a classic. And how can you pass up the presentation of serving it in the squash? *To make vegan, substitute butter for olive oil. Scrape out the seeds and stringy bits with a strong spoon, until the sides are smooth. Discard them. Lay squash halves cut side up. Place 1 tbs of butter in the middle of the well of the squash and add the garlic. Place halves in microwave and cover loosely with parchment paper. Tuck some of the sides under the squash to promote steaming. Microwave for 6-8 minutes. Remove from the microwave when soft. Let the squash rest for one to two mins to cool. Once cool enough to handle, use a fork to scrape the flesh of the squash. It will resemble stringy spaghetti squash. Scrape all of the flesh into the middle of the squash and mix with the butter and garlic. Season with salt and pepper to taste. 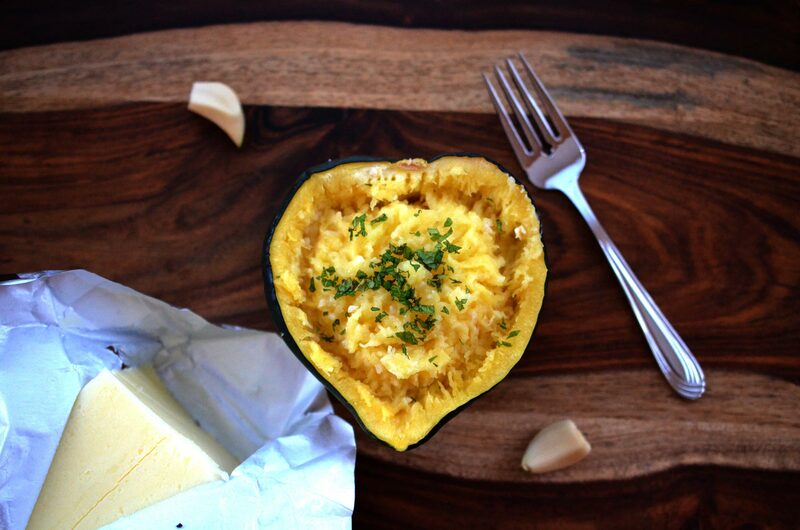 Serve in a bowl, or in the squash for a unique presentation. Sprinkle with chopped parsley if desired. This recipe can also be done in the oven, however it must cook for approximately 1 hour at 400F to achieve the same outcome.